The attack that took place on December 7, 1941, at Pearl Harbor on the island of Oahu, Hawaii, became the most shocking military defeat in U.S. history and plunged America into World War II. Japanese planes succeeded in damaging all eight battleships anchored in the harbor and caused over 3,000 American casualties. Japan severely incapacitated the U.S. Pacific fleet, but did not anticipate how Pearl Harbor would unite a previously divided America and commit a nation to war. After the attacks at Pearl Harbor on December 7, 1941, Americans cried out for war. On December 8, Congress convened and President Roosevelt spoke the famous words, “A date which will live in infamy.” The President then asked for a declaration of war. Through a roll call vote in both houses, Congress declared war on Japan one vote shy of unanimity. 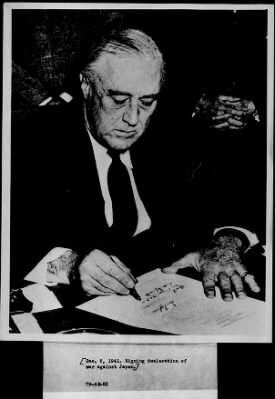 This picture displays President Roosevelt signing the declaration that sent the U.S. into war with Japan and also against Hitler’s fascist Germany.